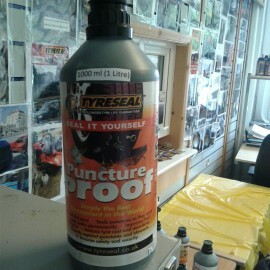 Tyreseal seal it yourself bottles are available to do it yourself if you cannot find a installer nearby. This product can be used for cars, vans, trailers, motorcycles, caravans, lorries, etc. All the instructions come with the bottle. 1000 ML bottles also available for Off Road vehicles for £12.00.